This page presents a summary of the plot and characters of Great Expectations, a novel by Charles Dickens. Great Expectations is a novel by Charles Dickens written and published between 1860 and 1861. The work was originally published in weekly installments, from December 1 1860 to August 1861 in the magazine "All the Year Round", a periodical directed by Dickens. Great Expectations is considered one of the greatest and most sophisticated novels by Dickens, and one of his most popular. The novel has had more than 250 adaptations on stage and screen. Great Expectations is representative of a type of book called "bildungsroman", which typically follows the fortunes of the protagonist in his or her search for maturity, often beginning in childhood and reaching middle age. Great Expectations is the story of the orphan Philip Pirrip called "Pip", describing his first days of his life from childhood to adulthood, as the protagonist tries, in the course of the novel to become a gentleman. Like David Copperfield, and many of Dickens' other works, the book is semi-autobiographical. The plot starts on Christmas Eve of 1812 (year of birth of Dickens), when the orphan is about seven years, and ends in the winter of 1840. Each instalment in "All the Year Round" contained two chapters and was written so as to "capture" the readers, stimulating their curiosity about the next episode. 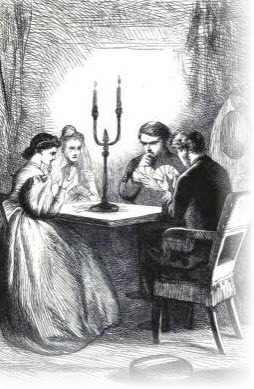 Great Expectations was first published in book form, in three volumes, in July 1861. The novel's protagonist is Pip (short for Philip Pirrip), an orphan who lives with his sister, many years older than him, and her husband. The relationship with his sister is not very good, because she is very often abusive and uses a cane which she has nicknamed Tickler. In a swamp near the village Pip encounters an escaped criminal named Magwitch who obliges Pip to bring him food and a file to saw the chains that bind him. Too frightened to disobey, the child steals food from the pantry of his sister's house although he is very afraid of she will find out. Later, Pip comes under the protection of a local aristocrat, Miss Havisham, in whose home he meets Estella, a girl who had been adopted and raised by Miss Havisham. Pip falls in love with Estella but she is unattainable because of his humble conditions and rough upbringing. Pip is paid to be a "playmate" for the old lady, but even though everyone thinks this is a great success because he is very happy to enter the house, the house of Miss Havisham inspires a sense of fear in Pip due to the fact that it is always intentionally dark. In fact, as Pipe later learns, Miss Havisham was jilted by her fianc� on the day of the wedding, who informed her in a letter that he had run off with another woman. Overwhelmed by grief, Miss Havisham decided to leave the house exactly as it was when she opened the letter, including the now moldy cake, lying on a table for decades. She also adopted Estella, a beautiful orphan girl, knowing that all men would desire but none could have her. In this way Miss Havisham hoped to exact her revenge on men for what had happened to her. Later in the novel Pip receives a huge fortune, which is believed to have been donated by his patroness, who had become fond of him; the benefactor wishes to remain anonymous, however. This new found fortune creates high hopes, or great expectations, for Pip. He movies to London to complete his studies and to enter into high society, but despite this, Pip can not quite settle into city life. Pip is also disappointed that Estella has married a brute. 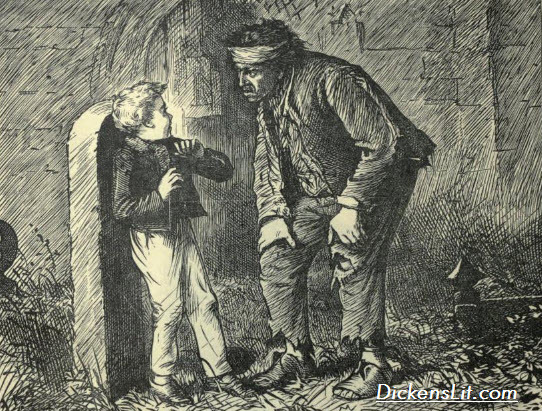 Pip subsequently learns that his fortune comes from Magwitch, who had been deported to Australia where he had made a fortune, but had kept intact his gratitude for the child, who had brought him food when he was hiding in the swamp. Magwitch comes to London to see Pip, risking his life, because he has escaped the deportation and would certainly be executed if discovered. Pip his forced to hide the fugitive. Ever since he was a child Pip has secretly felt guilty about helping the convict. He is afraid that someone will find out and he will be arrested. When Pip learns that his financial fortune actually comes from the criminal, he has an internal crisis. While in London, Pip learns of the deaths of his sister and of Miss Havisham. He also becomes friends with Herbert, and comes into contact with Jaggers, the intermediary who delivered the money from Magwitch. Pip receives a message that is invited to come to his home town to discuss important events. But it is a trap engineered by the aid of a blacksmith Joe Orlick, a violent and evil being, who locks Pip up in a shack and wants to kill him. Pip is saved only by last minute intervention of his friend Herbert. Together Pip and Herbert decide to help Magwitch escape overseas, but they are discovered. Magwicth is condemned to hand but he dies before he can be executed. Meanwhile, however, because of all the expenses incurred in London, Pip is no longer able to afford a luxurious life or to finish his studies, and so he returns to hometown, where he learns that Estella is the daughter of Magwitch. Dickens wrote two alternate endings to Great Expectations. The original ending was changed at the urging of his friend, the author Edward Bulwer Lytton, who allegedly advised him to end the novel with a happy ending. Most of the editions of the novel have been published properly in the first ending, or both, accompanied by explanatory notes written by Dickens. In the original ending, Pip meets Estella on the road. Her husband has died and she remarried, to a doctor Estella and Pip exchange pleasantries, after which Pip says that although in the end she may not have been his, he is glad to see that she is now a different person, different from the girl from the heart of ice that Miss Havisham had created. 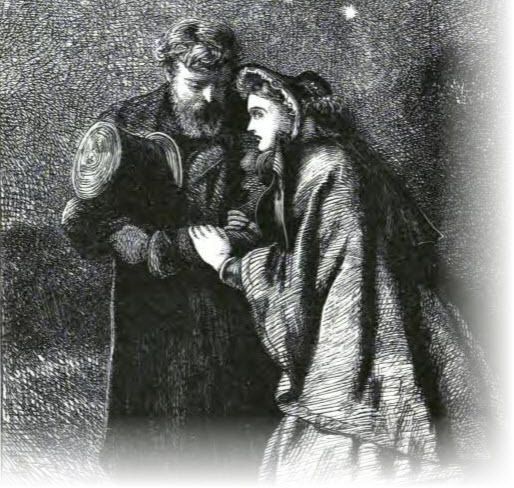 The book ends with Pip saying: "Suffering had been stronger than Miss Havisham's teaching and had given her a heart to understand what my heart used to be."